WWE legend Sting said in an interview that he is ready to come out of retirement if he had the opportunity to take on the Undertaker. One of World Wrestling Entertainment’s (WWE) most iconic superstars ‘The Undertaker’ is still not scheduled for a match in Wrestlemania 35. It’s very rare that the ‘deadman’ has not featured in the ‘grandest stage of them all’and this time too, if reports are to be believed, it will be no different. Another one of WWE’s legend, Sting is reportedly ready to come out of retirement for a match with Taker for one last time. Earlier in 2015, Sting was forced to retire from in-ring competition after he sustained a severe neck injury in a title match against Seth Rollins at the WWE Night of Champions 2015. 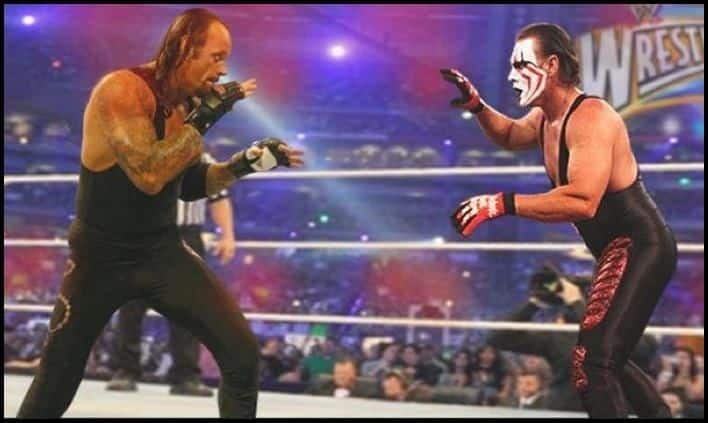 This match would be decades in the making, if it were to be materialsed. Wrestling entertainment fans from across the globe have longed for this fixture to take place but since Sting mostly plied his trade in TNA, the match could not happen. But the icon, who was forced to retire has stated that he will be ready to come out of retirement, only and only if he gets a match against Taker. In an interview with Wrestling Travel, he said: “I mean, everyone knows who it would be. Taker, he’s the only guy I’d come out of retirement for now. No one else. We could just never get it together to make it happen. When I started talking to WWE he was booked with Brock [Lesnar] and then I did the deal with Triple H and he had another feud going on at the time, so it was just one of those things we couldn’t make happen. Following this interview, several reports have emerged that the match could actually go on to take place. However, the authenticity of such reports have not been established but we will keep you updated on any development, if it takes place.